Both Dillon and Silverthorne are working on town revisions to re-subdivide land and structures to benefit their communities. Last week, Dillon Town Council approved a resolution to re-subdivide land that is currently being used for parking. This will create 11 new parcels in the town core area that can be developed. The plan is to convert some of that space into development-ready land and create a right-of-way on Main Street that would widen the sidewalks and create space for parallel parking. The Town of Dillon conducted a study in 2015 in regards to the amount of parking spaces compared to how many parking spaces are used during peak seasons. They found that of the 534 spaces, only around 280 were being used consistently. They say they will be able to convert some of the parking lots while still maintain more than 500 spaces for parking in the core area. This part of town has not seen new construction in 20 years because potential build sites didn’t exist and has struggled to generate business and foot traffic in the area. The Town of Dillon is hopeful that more business will be generated and new construction will bring more people to the core area of Dillon. The town of Silverthorne has started on long term plans to create a New Urbanist, pedestrian-friendly town core where the northern part of the “Green Village” in the outlets are. Their plan is to add residential structures to this area – between Rainbow Road and Blue River Parkway. Right now, Levi’s is the lone surviving store in the northern part of the Green Village where it sits on the corner. The parking lot and all other store fronts are completely vacant. The vacancy of this part of the outlets didn’t just happen overnight – it was part of a bigger, intentional plan for the space. When Old Navy closed in 2011, the company that owns the space began deliberately transferring stores to other spaces within the outlets in hopes of laying the ground work for a new future working with the town. The town is now working to redevelop the Green Village area. They will be meeting with a developer later this month to discuss the land and future projects. Their goal is to bring in more residential spaces to cater to locals as well as tourists. Although the Outlets has seen revenue numbers fall, it is still one of the town’s financial pillars, with annual revenue hitting more than $2 million. During peak season the stores employ around 800 people, making it one of the largest employers in the town. 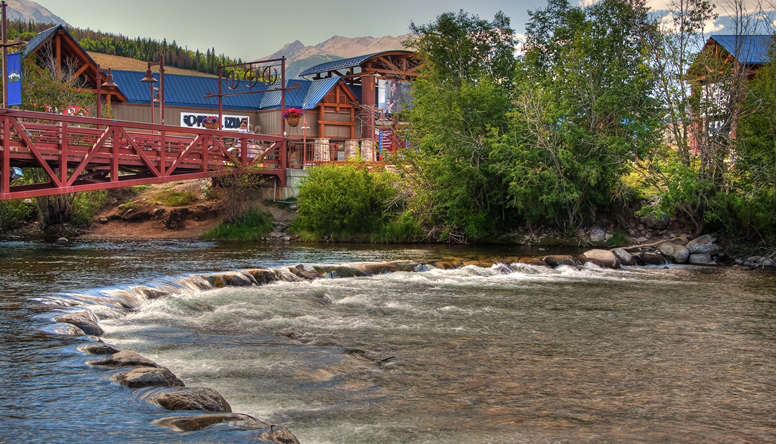 Strengthening the town core will help to bring more people to Silverthorne, which will benefit all the business in Silverthorne including the outlets.